Last year, I had come to develop a spiritless and contemptuous relationship with writing. I was beginning to loose interest in writing for this blog. Why? Because everything I thought it would turn out to be, it was not. I felt I was loosing myself and my purpose, so I decided to take some time away from blogging. I became really close to quitting for good. But before making up my mind to quit, I have decided to do some deep soul searching and self-reflection. Being a writer at heart I started blogging simply because I loved writing. But I knew in order for this blog to be sustained I had to figure out what my purpose was for doing this in the first place. Thinking of all this lead me to an aha moment...why don't I write a Writing Manifesto? The idea was perfect! 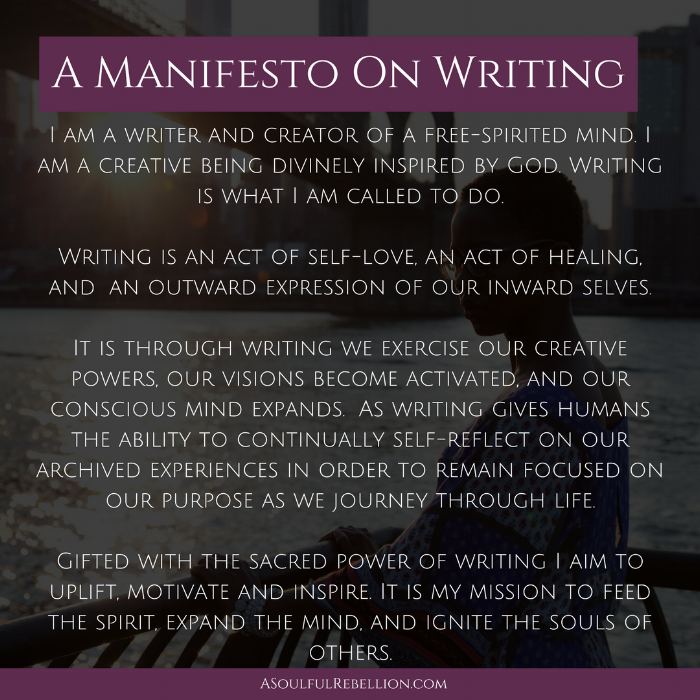 Creating a Writing Manifesto would help me to figure out and solidify why I I began blogging. It would also serve as a tool to re-center my focus whenever I am loosing sight of my vision. After writing out these words I was ignited with inspiration to continue writing for this blog. To be honest, after reading it back to myself it was hard to believe all of this came from me. Pats self on shoulder. This made me realize how empowering writing a manifesto for yourself can be, so I encourage you to do the same. If writing out New Year's Resolutions isn't your thing maybe you should try this out instead. Feel free to use what I wrote as a template (don't plagiarize of course). After all, a personal manifesto is much more empowering when you use your words to make it your own! You can choose to be more general or focus in on a specific area of your life. You can keep it short and sweet or a make it as detailed as you like. If you're anything like me, I know you would love to have a useful tool or resource as a guide to help you write out your own personal manifesto. So, no worries - I got you! Below I have provided a guide to writing your own manifesto in five simple steps. This isn't a step-by-step-how-to kinda guide. It is more of a prompting guide that provides you with soul provoking questions as you go through the process of writing your your own manifesto. Identify what you truly want or desire for yourself. You can do this by meditating to write down what key areas of focus comes up for you, stream of consciousness writing, creating a web or writing out a list. Do what works for you. Think about how you want to show up in the world. What do you want others to know about you? How do you want the world to view you? What are you called to do? What lasting legacy do you want to leave behind? Focus on your past experiences, what lessons have you learned from them? What do you know to be true? What do you want the world to know? What words of wisdom do you have to offer? 4| Your Vision, Mission and Purpose. How would you define your purpose? How do you plan to carry out your vision? How do you plan to live out your calling? What do you set out to do with the gifts, talents and abilities you possess? Now that you've been guided through the process it is time to piece it all together. Go back to your answers to each question, and re-write it as one whole piece. Use strong affirmative language, write in present tense, and be positive. Try to use words that evoke action. What to do with it when your done? Write it in your journal, type it up and frame it in a special place, or add it to your sacred space. I hope you have find this guide to be useful! Feel free to share your personal manifestos with me in the comments below, on Twitter, or Instagram .